Safe Bars will equip you with the tools to start a bystander-intervention training program for bars, clubs, and restaurants where you live. It’s totally customizable based on your community, and in fact, we encourage that! 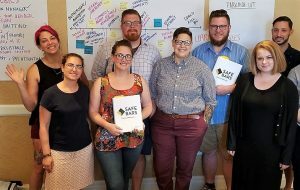 The in-person training focuses on curriculum content and delivery, as well as how to set up and run a thriving, sustainable Safe Bars program. Ready to take Safe Bars to your city or town? Contact lauren@safebars.org or 301.608.3708 to discuss details.